Heartfelt thanks to Caspette of The Narrative Causality for this lovely award! It's as cute as can be! I'm passing on this Heartfelt and Friendly Blogger Award to some of the many bloggers who share comments, and books, and hopefully they'll pass it on to others! Missy's Book Nook for another award! This is just fabulous! The Literary Blogger Award acknowledges bloggers who energize and inspire reading by going the extra mile! These amazing bloggers make reading fun, and enhance the delight of reading! To see the complete list of winners and categories, visit The Agatha Awards. Teaser Tuesday meme courtesy of MizB at Should Be Reading. Choose two sentences at random from your current read; include the title and author for those who might want to read the book. In Sudden Death Sudoku, a mystery novel, Katie McDonald enters a sudoku challenge game and finds problems that lead up to a murder. "Maybe Gordon was a cheater. Or maybe he was right, and there was more jealousy than truth in the accusation, which would be a shame." In the middle of reading a long and serious book for a book discussion group, I found this light and amusing mystery novel, a really good comedy, which I read in less than a day! In Killer Cruise, one murder is enough! But there are many possible culprits on board the cruise ship Festival, ranging from a jilted ex-fiancee, an ice sculptor, and the relatives and friends of a silver haired lady being swept off her feet by love at first dance. Our heroine and crime solver, Jaine Austen (with an i in Jane), has some setbacks on a cruise she was expecting to be a lot of fun. She is an employee, hired to give writing lessons to cruise passengers, but only five show up. She has an unintended stowaway, her cat Prozac, who had to be sneaked on board at the last minute. While hiding Prozac as well as reading the hefty manuscript of her cabin steward, the would be writer Samoa, in exchange for his silence about the cat on board - Jaine finds time to do some snooping to solve a murder while also indulging in her passion for midnight snacks and all things chocolate. Though this is a mystery novel, I chuckled all through the book, and laughed out loud at the ending. Humourous lines on every page. Readers who like comedy and mystery will like this one. By the way, author Laura Levine is a comedy writer who has written for TV shows such as Three's Company, Laverne and Shirley, and The Love Boat. This is so much fun! I've gotten another Lemonade Award, thanks to Missy of Missy's Book Nook. 1. Put the Lemonade Award logo on your blog or post. 2. Nominate up to 10 blogs that show great attitude or gratitude. 3. Link to your nominees within your post. Let them know they have received this award by commenting on their blog. 4. Link to the person who gave you your award." This novel is about a child born at midnight 1947 on India's independence day from Britain. The book follows his life (and India) into the modern age. "Snakes can lead to triumph, just as ladders can be descended: my grandfather, knowing I would die anyway, administered the cobra poison. The family stood and watched while poison spread through the child's body...and six hours later, my temperature had returned to normal." The story of Isabella of Castille and her husband Ferdinand of Aragon uniting Spain in the 15th century is a lively tale told by Lawrence Schoonover in Queen's Cross. For this review, I mainly did a summary of the book, but the story is so interesting I couldn't resist. My precis has omitted a lot of historical and other details, which the book itself can supply. It's a well known story, but Schoonover has enlivened 15th century history, bringing us the amazing life of Isabella of Spain. Henry later has a daughter but disowns her as not his biological child, and when his second child, a son, is stillborn, Isabella and Alfonso once again assume the title of Infantes, successors to the throne. To avoid being forced into an arranged marriage, Isabella schemes to marry Ferdinand of Aragon. Her brother Alfonso dies before he can become king, and Isabella is crowned queen of Castille on the death of King Henry. The landing of the Turks in Sicily, on parts of King Ferdinand's lands, prompts Isabella to begin the building of a fleet of ships, an armada. The Moorish war continues, and so does the spread of the Spanish Inquisition. Granada falls and becomes part of Spain. With the lands under Christian control "from Granada to the Pyrenees," Spain is united, and Ferdinand reluctantly agrees with Isabella that Christopher Columbus can begin his celebrated voyages. "Oh very well, senora mia," he agreed grudgingly. "I suppose we can afford him now, and you seem to feel strongly about him. Sail him way, for all I care, out of this world. At least he'll quit pestering me." Those who like historical fiction and 15th century Spain will enjoy reading Queen's Cross, one of several historical novels written by Schoonover. New York Times metro reporter researches and writes about Chinese food in her memoir, The Fortune Cookie Chronicles: Adventures in the World of Chinese Food, 2009. "It gnawed at me. Could fortune cookies have been introduced to the United States by the Japanese?" "Two men in the early 1900s in California claimed the credit - a Japanese man who served tea and fortune cookies in 1914 in San Francisco, and a Chinese man of the Hong Kong Noodle Company in Los Angeles who stuffed Biblical messages in cookies. A judge ruled that Japanese-American Makoto Hagiwara of San Francisco was the real inventor of the fortune cookie!" Jennifer 8 Lee tackles other questions about Chinese food as well in her memoir -the origin of chop suey, American stir-fry, and the phenomenon of multiple lottery winners on March 30, 2005 who bet on the same numbers provided by their fortune cookies! The book details Chinese restaurants in the U.S. and around the world in places such as Australia, Brazil, Toyko, and Dubai, United Arab Emirates. There are explanatory notes on each chapter at the end of the book, and an impressive bibliography. The author certainly did her homework for this one! However, I was prepared for a memoir rather than a book of such detailed restaurant and food research. The information wasn't new or unusual enough and much of it seemed to me to be already common knowledge. Correct me if I'm wrong! I'm still coming down from the emotional roller coaster ride of this book. It made me alternate between laughing and crying, then I was plunged into feelings of dread and doom as I watched/read scenes that reminded me of Faulkner's The Sound and the Fury. Then the novel, for me, descended into horror, which the tidy ending doesn't much dispel. 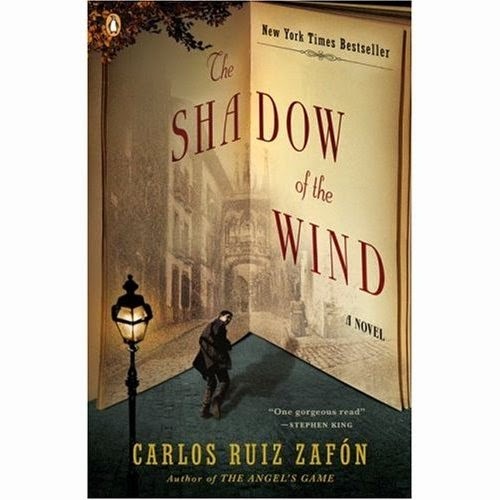 I think the author may have intended to evoke these feelings, his characters reflecting a side of Barcelona and Spain during and after the Civil War, and during the repressive Franco dictatorship. I can't decide if it's a four or a five star read. I gave it the benefit of the doubt, despite or because of the feeling of awesome dread that the book left me with. This excerpt, central to the plot, can probably give a sense of the atmosphere and mood in the novel that precipitates the catastrophic events. "Sophie had only to exchange one look with Don Ricardo Aldaya to know she was doomed. Aldaya had wolfish eyes, hungry and sharp, the eyes of a man who knew where and when to strike. He kissed her hand slowly, caressing her knuckles with his lips. Just as the hatter exuded kindness and warmth, Don Ricardo radiated cruelty and power." p. 380. Book lovers will like the basic story, of a boy who discovers a fascinating book and sets out to find out about the author Julian Carax and the reason Carax's books are being systematically sought out and destroyed. What he finds are the stories of a group of boys who attended the same elite Catholic school years before, how the boys' lives intertwined and even collided over the years, and the mystery and tragedy that resulted. I found these stories powerful and intriguing, the writing and characterizations excellent. I read all 487 pages in three days! The novel was translated from the Spanish by Lucia Graves. Lost in Translation Reading Challenge. The Kiss Murder by Mehmet Murat Somer of Istanbul, Turkey, is the first in the Turkish Delight mystery series that has been translated into English and published by Penguin Books. The main character, who works with computers in the day, dresses up as Audrey Hepburn at night, when he runs his unconventional nightclub. The mystery involves the murder of one of his nightclub employees, who had refused to turn over letters from a client that someone wants to use for blackmail. Though the book is described as "outrageous and hilarious" and very popular in the author's native country, Turkey, I find much of the humor has been truly "lost in translation." What may be excruciatingly funny in the original Arabic, culturally and linguistically, unfortunately didn't carry over for me into the English version. The "humorous" events fell flat. If you can, try reading the novel in the original! Note: A "Teaser Tuesday" meme quote from the novel generated the comments for this post. There is a lot to like about this mystery by Anthony Eglin. 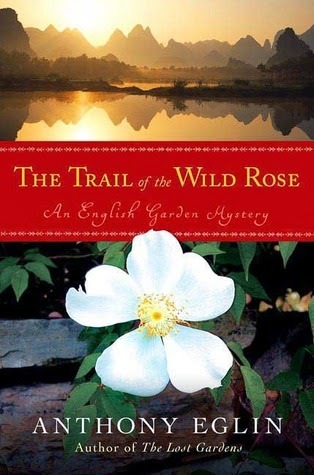 In The Trail of the Wild Rose, plant lovers will like Eglin's discourses on the history of the modern rose; travelers will like the descriptions of gardens around England, and mystery lovers will like the elaborate plot. The plot has plant hunters mysteriously dying off, the first during an expedition in the mountains of Yunnan, China, and the second in a hit and run four years later. Will similar "accidents" happen to the third, fourth, and fifth persons who were on the plant expedition with the first victim? What is behind the deaths, and does it have any relation to their plant gathering in China? The plot has lots of red herrings, false leads, and more than a few culprits who go out of their way to obscure the truth. Readers will find the main character, retired botanist and teacher Lawrence Kingston, very British and quite charming as he goes about sifting out facts, smelling the roses, and helping the police come up with solutions. I enjoyed the novel for the detailed history on roses and their propagation,and for the descriptions of historic places Kingston visits - Oxford, Dorset, Cornwall, London, and Wales. I thought the plot in this book better than the previous one in the series, The Water Lily Cross, which had a plot that was unbelievably close to sci fi - a waterlily hybrid that desalinates sea water, turning it into fresh water over time! Wouldn't that be a prize piece of genetic engineering if it were true! Mystery Readers International and Mystery Reader Journal have nominated the following mystery novels for The Macavity Awards. Awards for 2009 will be presented in October at Bouchercon in Indianapolis. Bon Appetit reads like a memoir but is a light and entertaining work of fiction about an aspiring chef from Seattle who travels to France to work in bread and pastry bakeries in the village of Presque le Chateau. Throw in some recipes, descriptions of trips to Paris and Versailles, a budding love affair that could turn into a love triangle, and you have a Bon Appetit of a book! I copied the recipes for French Onion Soup and Simple Apple Galettes and promised myself to try them. There is also a tempting recipe for Chocolate Truffles which sounds very easy to whip up! Bon Appetit is the second in a series of three novels with chef Lexi Stuart. The first, Let Them Eat Cake, is set in Seattle, and the third, also in Seattle, will continue the saga of Lexi's development as a bread and pastry chef and probably settle the question, "Which one of her suitors will she choose?" This is also the first "religious" novel I've ever read. The main character prays when she is in a dilemma and relies on quotations from the Bible to carry her through the ups and down of her culinary experience. Interestingly, this didn't bother me as the novel was not overly spiritual, nor preachy. Fault Line is a fast paced thriller with an intriguing plot and lots of action. Three people connected to a brand new computer security software, Obsidian, including the softward developer Richard Hilzoy, die suddenly, one after the other. It begins to seem like a nasty conspiracy to Alex Treven, Hilzoy's lawyer, who gets so nervous he calls his estranged older brother Ben for help. Obsidian is being patented and is not yet on the market, but someone wants to make sure the software is never introduced to the public. Ben works for a branch of the government in special operations, and is more capable of handling "bad guys" than the bookish Alex. Though they haven't been in touch for years, Ben flies in to San Francisco to help his brother, protecting him and his associate Sarah from the ruthless group out to destroy the Obsidian software and all the people who know about it. The question is, why is this particular software so threatening, and to whom? The personal relationship between the three main characters, Alex, Ben, and Sarah, adds to the interest in the book. Why is Alex and his brother Ben so antagonistic to each other and what has kept them estranged until now? Who has been the "better brother" in the family over the years? And who gets the girl in the end? "The truth was, bad memories never died. No, at best they were quiescent, just waiting for the right circumstances to pop up like an evil jack-in-the-box and say, Miss me? Don't worry, I'm still here! And I'm not going anywhere, either. Never, ever." This book will appeal to those who love lots of quick action, suspense, and a good plot. Eisler has also written a John Rain thriller series, one of which, Rain Fall, has been made into a movie just released in Japan.